I, myself, have never had the good fortune to ride in a free carriage made out of a transformed pumpkin. Perhaps you have had better luck than me? If not, there have likely been times in your life where you wanted to get from Town A to Town B for as close to free as possible. 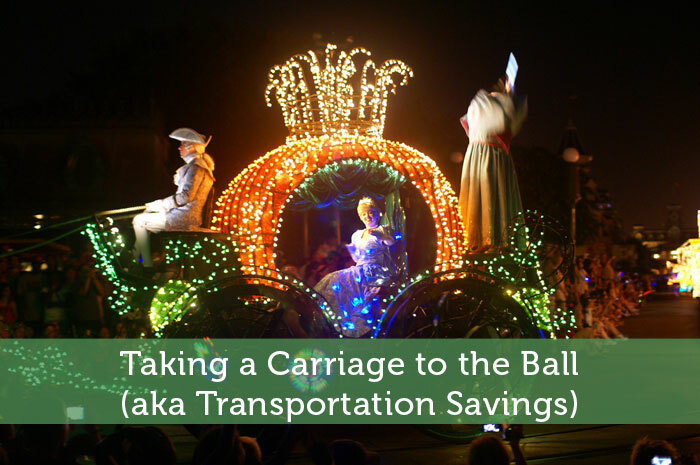 This is a collection of rather straight forward ways to help save yourself a few bucks on transportation costs related to attending a wedding (or a family reunion, school reunion, graduation…you get the idea). Basically, they are all premised on several people doing exactly the same thing as you, there are decided benefits to being a Sheeple! This may be the easiest way to acquire some savings on transportation. Chances are, if you are attending one of these events, you know a few people who are going. You can post on Facebook that you are looking to split a ride to and from. Even if it will only be a ride between the hotel and the event, that can help you save some coin! A note of caution: sometimes, especially in the case of weddings, guest lists are sensitive matters and some people may be very disgruntled to hear that you received an invitation and they did not. So, you may want to use the direct approach, where you ask the host who is coming from your area, to be more sensitive. Who knows, you may make some fantastic new friends if the host puts you in touch with someone you don’t already know. If you live in a larger city, especially those with universities, there is likely a well-established ride share program. Obviously, you should exercise caution and trust your instincts when accepting a ride from a stranger. That said, you can often go great distances for only the cost of gas! I often made use of ride shares between Ottawa and Toronto, many times making the trip for only $20 or $30! Alternatively, it may be a good way to offset your own gas costs, by offering up a ride in your vehicle. Looking to arrive in style with the latest sports car? Looking to pull up in a loaded mini-van, with frugal personal finance bloggers cheering you on? Pull together a group of friends and split the car rental that you need to get around the local town or from your hometown to the event. Splitting a minivan amongst six friends can result in an awesome road trip that doesn’t break the bank! Check out rent-a-wreck for good prices and most importantly, read the fine print on your credit card. Many credit cards offer car rental insurance as a benefit, which can save a lot of money! There are usually restrictions on how many days it is valid within a certain time period, so be sure to do your research. Unless you are in a situation where the gracious hosts have arranged transportation back to your hotel or home, you will likely need to take a taxi home from the event. Especially if you are staying in the group hotel, you should arrange to split a cab before the night starts! When you stay in the same hotel as your long-lost frat buddy, you can pre-plan how hard you will party and take a cab at the same time. Take the Vomit Comet, aka the night bus system in Toronto (and many other cities). If you spend ten minutes researching public transit, you may find that you can safely return to the place you plan to stay for only a few dollars. This is especially true in cities with subways. Chances are your hotel will be located close to major transit centers. These ideas are not revolutionary, but I hope that they encourage you to take five minutes to save yourself some coin the next time you need to attend a destination event. If you would like some more tips on ways to save once you have arrived at your destination, may I suggest my 4 Wedding Food Savings Tips for Guests! The vomit comet?!? Ha! Love that one! When I was younger, it was always nice to split a taxi. Rides can be expensive, even when splitting, so it is great if you can fit 2 or 3 people in on it. I didn’t realize the vomit comit was as rare a term as it apparently it! In my town, taxis are a million dollars, so I definitely like splitting them! Ha – yes, rather descriptive! I used to split car rentals in university for sure, we crammed them full of people. I have only taken it once… and didn’t have to witness its namesake, whew! Oh, transportation. I wish they weren’t so expensive, but these are great tips Anne. I definitely split cabs whenever possible and I love the idea of a rental share. A custom vomit comit? That’s awesome! I bet there are a lot of interesting tales and observations from riding it. The “Vomit Comet”….haha! That was hilarious. I always try to carpool when going somewhere. With gas prices these days it definitely pays to carpool. Carpool lets you pay half, even with only one other person. It’s definitely worthwhile! I’ve carpooled to most of the weddings I’ve been to. For one wedding, I even snagged a ride in the limo with the groom and the groomsmen! Other times, I rode with my buddy’s girlfriend since she doesn’t really like long drives alone and my buddy has been a groomsman for all of the friends weddings I’ve been to. That’s great that you have people going to the same weddings as you frequently. I would add to the list try to get a work from home job. If you add up the expenses that traveling TO and FROM your work costs you may realize you can accept less money and keep the same lifestyle. So true, commuting has a huge cost, both in direct transportation costs and in time. It’s very true. It’s one reason why I chose a job nearer to home rather than the city. It also means I get a couple of hours of my own time back as well. I always try and car share when attending an event. It’s also important to do your bit by being the designated driver every now and then. Oh the sacrifice 😉 Yes, that is an important point. When I lived in Chicago I always took public transit to work. Not only is it cheaper but I would get to work much quicker than driving. With more and more happy couples making a website to prepare their wedding it is easy to find people to split the costs of rides. Although the ride back is always a bit tricky with people wanting to leave at different times. I’d look for a hotel close to the venue to walk back and avoid the vomit comet. No risk taking then? Avoiding the vomit comit, haha. Yes – wedding websites make it even easier. They are fantastic for having information and connecting people. That’s great! Plus, it’s much better for the environment and means that not everyone has to be the driver. We have absolutely no public transportation in our area other than the senior citizen van that will take you to the doctor if you are a senior or the bus that runs to the casino on the reservation (not a good way to save money!). I have tried to carpool with getting our daughter to school. Trade off of a small town, I guess. Same here, we have a twice daily shuttle to a larger city, with a regional hospital. That’s about it. For myself, transit saves the day. I take it to work every day. Even though it can be a pain, it is cost effective and pretty fast. The Vomit Comet…awesome. And I’m disappointed. No pumpkin rides? I thought you wore glass slippers…. If I’m headed to a popular location (such as downtown at FinCon), I saved a ton of money by taking the city shuttle vs. a taxi. The cost was less than half, with only a few stops between our hotel and the airport. Glass slippers sound rather uncomfortable. If I could wear skate shoes to work, I would! A city shuttle? Interesting. FinCon is probably FULL of people willing to split transportation, haha. Haha, man woudl it be awesome to have a pumpkin that turned into a helicopter or something. With kids, some of these options are tough though, dude, I have to say. Kids complicate things a little. True story, regarding the kids. If you’re rocking a minivan, you can probably pick up an extra passenger (assuming you have the space) for a few bucks. Now I want a pumpkin helicopter!!!!!!! Be frugal and practical. The limo may not be practical. The cab may be a better option. Transportation savings is a big deal after all. It’s funny — we still use the phrase “I’m a pumpkin” when we want to go home from somewhere out. Thanks for the visual! If I can save transportation or gas money, I might as well follow these tips. As they say, a penny saved is a penny earned. Thanks to work picking up my transit pass, I sold my car last year and we’ve been a 1-car family for almost a year now. The savings are great! That’s cool that your work covers your transit passes. I bet the people who drive into work are jealous of that extra perk. My girlfriend and I both take transit to work and have no problem just having 1 car between us. Great ideas… I do ride sharing a lot with friends especially to our sporting/recreational activities. I also wanted to reduce transportation costs so much, 4 years ago I moved closer to work cutting my monthly gas expenses by 50%! There are also some pretty great travel saving opportunities like Couch Surfing… although I haven’t tried it myself one of my customers swears by it! Moving closer to work is a good idea, not just for saving money on transportation. The time savings is huge too. Since we spend so many days at work, who wants to waste their time with a long commute. Plus it’s better on the environment.